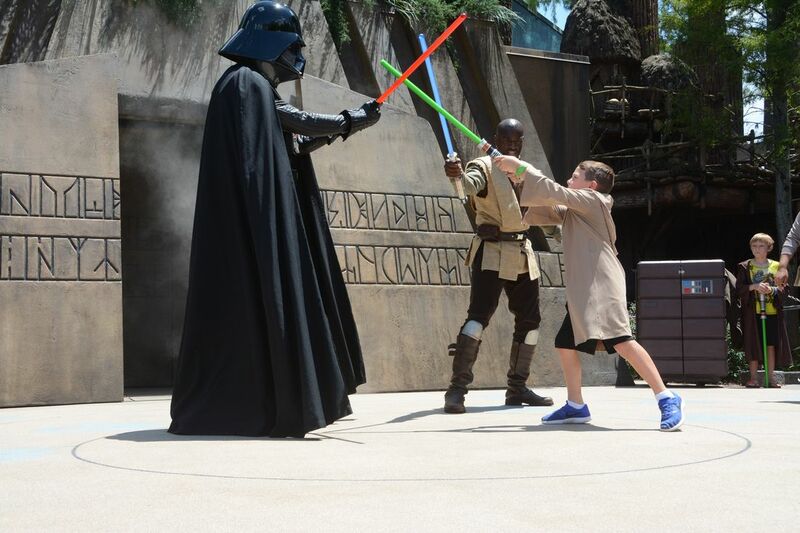 Have your kids ever participated in Jedi Training at Walt Disney World? Learn all about Jedi Training and the easy tips and tricks I used to make sure my son got his wish to battle the dark side. Every time my family goes to Walt Disney World I forget to sign my son up for Jedi Training: Trials of the Temple. You can imagine how disappointed a young Star War fan becomes when they find out their parents forgot to sign them up for the Jedi Training Academy. At least I have a good excuse for being absent minded. Usually I’m trying to get my family over to Star Tours or Star Wars Launch Bay. It’s hard not to get sidetracked when you’re visiting Hollywood Studios. Using a few easy tips and tricks helped me remember about the Jedi Training interactive outdoor show on our last visit. Also, using my tips and tricks reassured my son a spot to test his skills against the dark side. 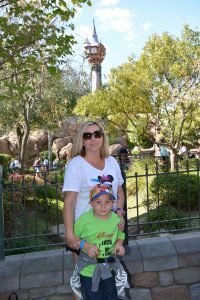 If you have a child that wants to master Jedi Training at Walt Disney World use these easy tips and tricks. 1. 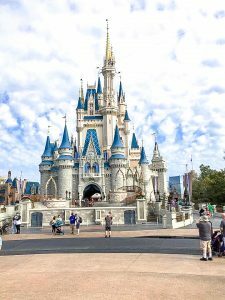 Use a Disney Travel Planner – Yes, you read that correctly. A travel planner allows you to list all the important things your family wants to see and do while on vacation. Of course, on the top of my list was Jedi Training at Hollywood Studios. 2. 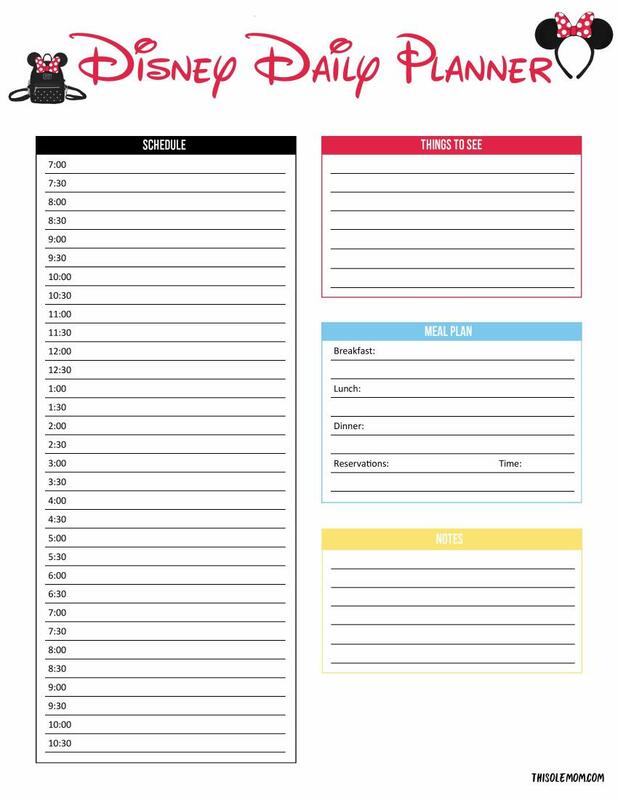 Use Sticky Notes – Place sticky notes where you can easily see them to remind yourself to wake up early on the day you want to have your kids participate in Jedi Training. I stuck sticky notes on all over the bathroom mirrors in our resort room with the date written on them. This way we could remember to wake up early on the day we wanted to sign our son up for Jedi Training. 3. Send Yourself Reminders – Send a reminder to your cell phone. Remind yourself to go directly to Indiana Jones Adventure Outpost to register your kids as soon as you arrive at Disney’s Hollywood Studios. 4. Set an Alarm – Set your alarm on your cell phone so you can wake up early on the day you want to register your children or have the front desk wake you up. 5. 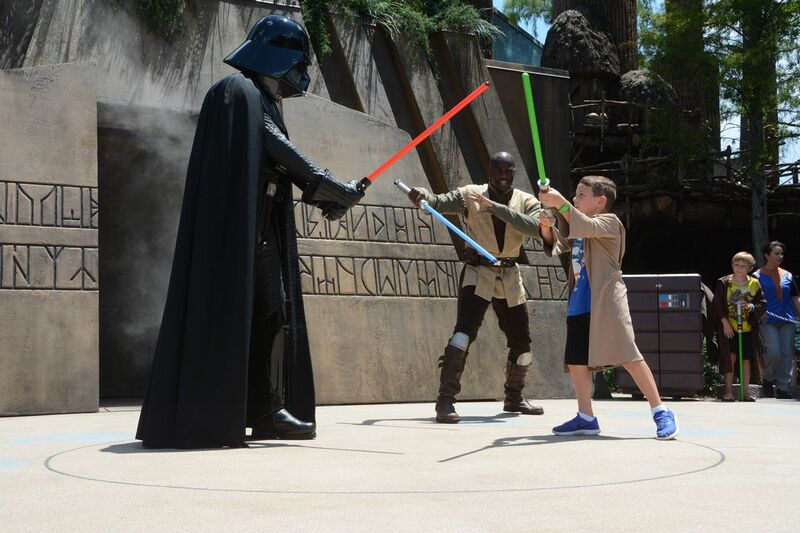 Sign Up Early – If your young Jedis are sure they want to sign up for Jedi Training at Walt Disney World, make sure to sign up as soon as you enter the park. You can even do this on extra magic morning hours. Registration is on a first come, first served basis it’s important to get there as soon as you go through the gates. Slots go fast! On the day we registered my son for Jedi Training: Trials of the Temple we arrived at the park and waited for it to open. Then we went straight to the designated area to register him. 6. 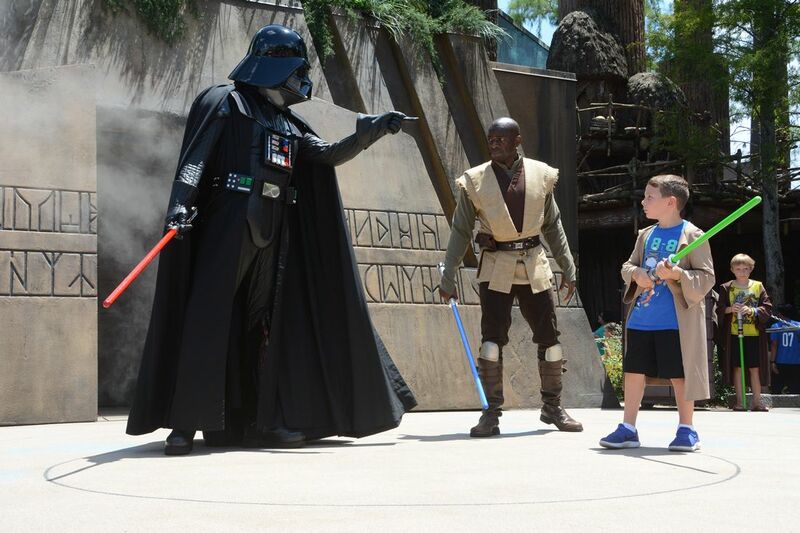 Bring Children to Register– Your child must be present when signing up for this incredible free Jedi Training at Walt Disney World. 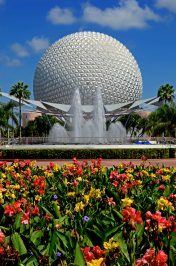 Disney cast members will ask each child a set of questions to make sure they can follow directions and be safe on stage. Also, let your kids know that the training academy is just for fun and the villains aren’t real. 7. 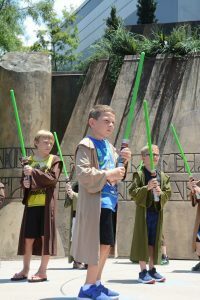 Theme Park Admission – Kids must have a valid theme park admission and be between the ages of 4 and 12 to participate in the Jedi Training. When your children are registered, you will receive a receipt with the return time written on it. 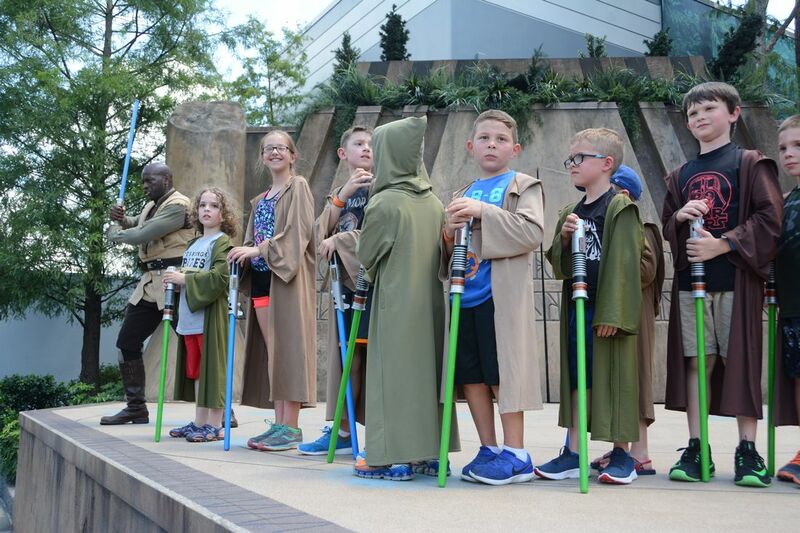 All kids participating in the Jedi Training will need to return to the sign-up location 30 minutes before show time. If there are no spots available your child’s name will be added to a waiting list. Showtime- Return to where you registered your kids 30 minutes before their show time . Each child gets an awesome robe to wear and lined up according to height. One parent is asked to walk next to their child. Cast members carry a banner and march the young Jedis (Padawans) and their parents to the stage. As the children walk to the stage they are encourage by the cast members to yell “Here Come the Jedis” to get the crowds to move aside. Additionally, when the children get to the stage one line of kids will go on the top level and the other line of kids will stay on the bottom level of the stage. Make sure to grab a good spot to watch the show. If you have Disney Memory Maker Photopass you can relax and enjoy the show. 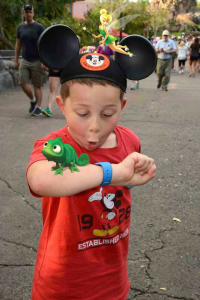 Photopass members are at every show taking amazing photos of the kids. After the show one of the photographers will give you a card for you to download photos that don’t automatically download to your memory maker account. 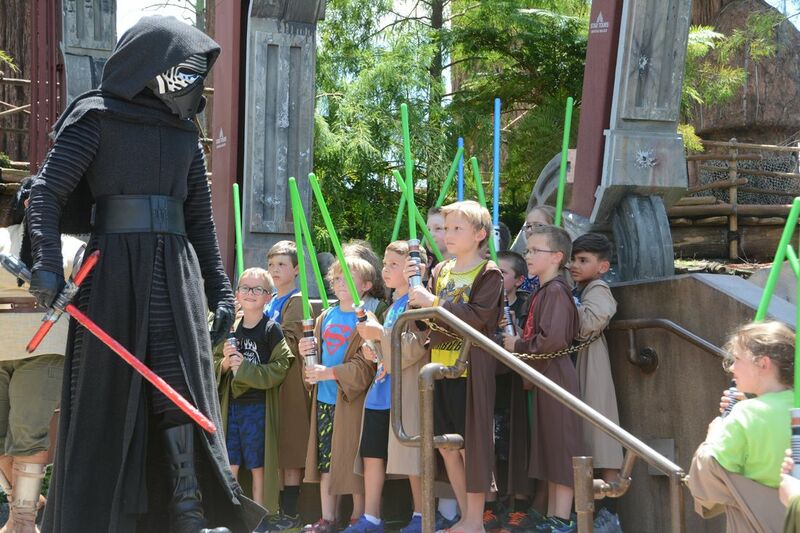 Cast members will give each young Jedi a plastic lightsaber to use. 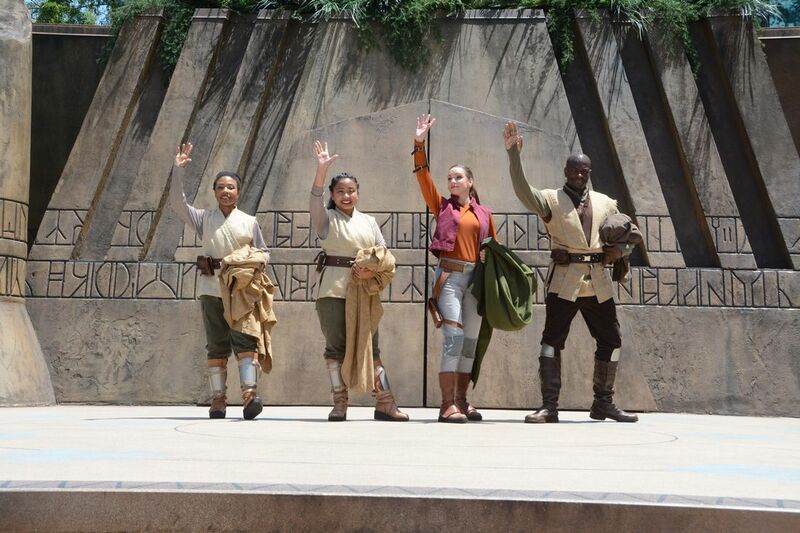 The Jedi master and cast members will teach the children different techniques before they get to fight the villains. When my son was partaking in the Jedi Training Darth Vader, and Kylo Ren attempted to sway the children to the dark side. Each young Jedi gets to battle one of the villains. The show lasts about 25 to 30 minutes with the villains ultimately defeated. Then the lightsabers and robes are collected from the children, and each young Jedi receives a free pin. The pins each kid receives make a cool Disney vacation memento. 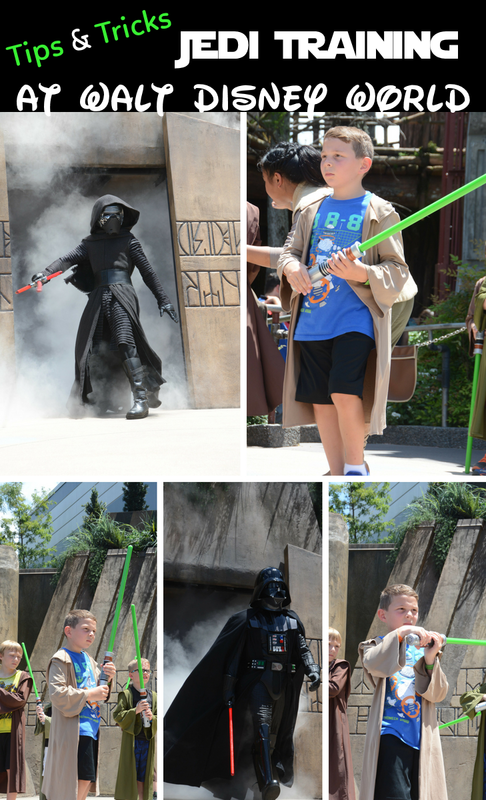 The Jedi Training Academy at Walt Disney World Hollywood Studios make this experience for kids a little bit more magical with the villains, all the excellent actors, and fun sound effects. Doesn’t it make you want to participate? 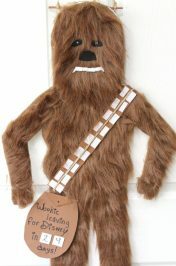 Grab your Disney Travel Planner here and find out how to make a DIY Chewbacca Vacation Countdown here. I haven’t heard about Jedi Training before but it sounds amazing. Every child would love this. Even as a teenager, I still want to try! Now my grandkids would think this is a blast. They would be so excited over Jedi training. Who am I kidding I would be excited over Jedi training. This sounds like such a fun thing to do for Star Wars lovers at Disney. It’s a shame adults cant have a go, I know so many that would love to have a shot at this! Awww! How much fun is that! I love Star Wars but my son, sadly, didn’t inherit my love for the series. Wish I were under 12 to go to Jedi Training! Amazing pictures! 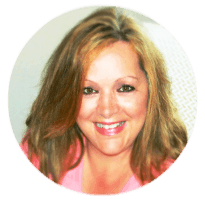 I love your schedule… Definitely required at Disney World! Oh my gosh, am a big Star Wars fan! I would definitely want to join this but such a shame indeed that adults can’t participate. This Tips and Tricks for Jedi Training at Walt Disney World – is just way too cool! This is so cute! I love the Star Wars franchise and I’d like to see little kids play Jedi. This is such a cool experience. I am sure your children will remember how fun it was to jedi train for a lifetime. This really does sound like an incredible experience. I only wish it was offered for kids of all ages. I have a particular fan who’d go nuts over something like this. This is ao cool. I remember there is a Jedi training workshop every weekend near my place, and seema ita a good motivation for kids to exercise. I’m not into stars wars. But I’m pretty sure even if you’re not even your kids will enjoy this. Very fun to look kids having that sword! I can’t believe we’ve missed out on this twice! On our next Disney trip to do! Always so much to see and do there and always come back with a to do list for next trip! Kim!! 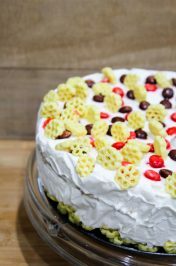 This was a fantastic article! So many awesome tips too!! 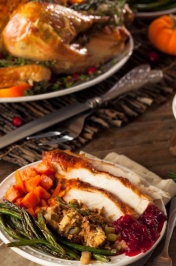 Thank you so much for sharing these tips and your experience! This is quite a magical experience!